In addition to extensive solutions for the trades, Sortimo offers efficient solutions for the sales force. We’ve developed a number of solutions to be used in both the commercial vehicle and the estate car. 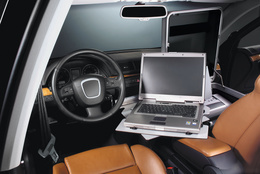 The mobile office can be used as a supplement to our in-vehicle equipment and gives you the opportunity to make the most of your working time and your vehicle.